Punschrullar from Ikea in the standard packaging. The Look: Something like giant green caterpillars. 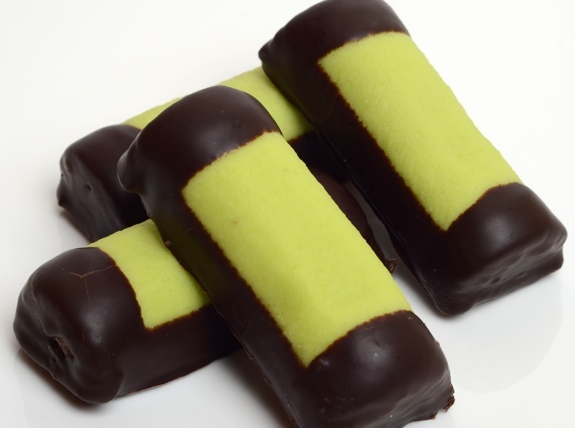 A bar of bright green marzipan with both ends and the bottom dipped in chocolate. 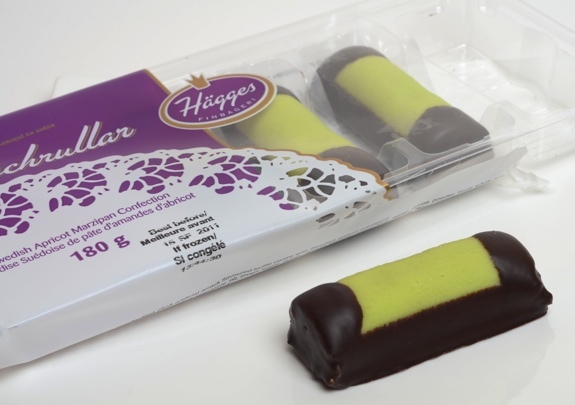 The Pitch: “Swedish apricot marzipan confection,” says the package. “Sign me up,” says me. Reality Check: A key ingredient in marzipan is, last I checked, almonds. The only mention of almonds on the packaging is in the phrase “Traces of almond may be present.” A little Wikipedia digging cleared things up. Turns out, there’s a substance similar to marzipan made with peach or apricot kernels. As such, this “apricot marzipan confection” doesn’t contain marzipan and apricots, but rather a marzipan variant made with apricot kernels. Now you know. The Taste: Like a rum ball, but grainier (the second ingredient is rolled oat flakes). Soft, with a dominant boozy taste to it, which would be the arrack flavouring. Some chocolate, but the apricot marzipan and arrack flavours drown it out. Punsch rolls from Ikea! Don't they look yummy? Cost: $2.99 per four pack. Value for cash money: Not bad. Less than a buck per piece. Availability: Ikea stores, presumably worldwide. Nutrition? : 190 calories per 45-gram bar. A reasonable dose of iron, too. The Verdict: Quite good, though I can only handle one at a sitting. A close detail of the filling and the shell. 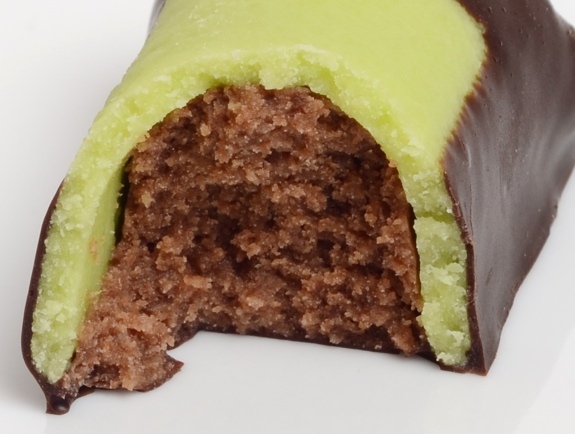 Oh yes, K&K is The place to go for real marzipan! For about 2 & 1/2 years(late 80s)I lived just over half a block east, right on Whyte Ave, so I was often there at least once a week. But the other day, as I was doing grocery shopping at the Italian Centre & this Was German chocolate…;-) I must admit though, despite the selection they have not all the chocolate at the Italian Centre is up to my standards. I’ve almost always preferred the German dark.